Hiroko Shimbo is an authority on Japanese cuisine who has earned world-wide recognition. She is a chef-instructor at respected culinary schools, a consulting chef to diverse food service industries including numerous restaurants and manufacturers, and a prize-winning cookbook author. She has been based in the United States since 1999. Her associates and clients comprise a domestic and international cohort of renowned food professionals, organizations and companies. Hiroko’s professional activities include attendance as a chef and moderator at international conferences and cooking events. For selected clients she provides executive chef services for small and large scale catered events. Hiroko frequently teaches hands-on specialty courses on subjects such as sushi and ramen, and intensive courses on basic and advanced Japanese cooking. Currently she instructs a one-week course, Essentials of Japanese Cuisine, at the International Culinary Center in New York City. Hiroko has written three award-winning cookbooks. The Japanese Kitchen (Harvard Common Press, 2000: International Association of Culinary Professionals [IACP] 2001 Finalist) and The Sushi Experience (Alfred Knopf, 2006: James Beard Foundation 2007 Finalist). The Japanese Kitchen and The Sushi Experience are considered essential primers on Japanese cuisine and continue to attract readers who are professional chefs and home cooks. Hiroko’s latest book, Hiroko’s American Kitchen (Andrews McMeel, 2012) was selected from among 450 books to receive the 2013 Cookbook Award as the Best American Cookbook of the year. Hiroko’s American Kitchen offers an entirely new perspective on Japanese cooking. Rather than providing instruction for preparing authentic Japanese cuisine, the book focuses on a larger audience of cooks by integrating Japanese flavors and cooking techniques with readily available produce, meats and seafood to recreate dishes already familiar to the American table but with unique added appeal. In addition to her books, Hiroko has also contributed numerous articles to Zester Daily which you can find by clicking here. Hiroko’s latest passion is to create and conduct tours in Japan which take tour attendees to places where they can be totally immersed into the history, food culture, arts and crafts and society of Japan. To learn more visit our Tours section. 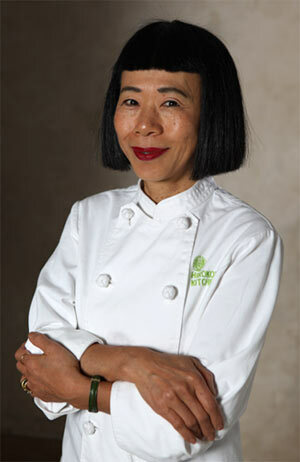 Hiroko is a member of Les Dames d’Escoffier, New York Chapter.